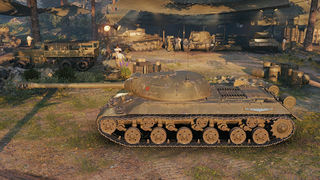 The IS-3A is a Soviet tier 8 premium heavy tank. The IS-3A has a measly 520 horsepower engine that is even weaker than the stock engine on the IS-3. This severely limits the IS-3A's mobility, especially when trying to climb. Its marginally higher top speed of 40 km/h is difficult to reach, unless going downhill. As a result, it pays to keep the IS-3A on flat terrain, and, if possible, on city streets. Compared to the regular IS-3, the gun loses much accuracy in exchange for the powerful autoreloader, and is plagued by abysmal soft stats, which make getting those signature IS-3 snapshots extremely unlikely. Having some of the worst accuracy of tier 8 combined with the inconveniently low ammunition capacity of 28 rounds means it is highly recommended to limit most engagements to within 100 meters, where the IS-3A will be able to leverage its high burst damage most effectively. By steadily landing 3 390-damage shots in a rapid succession, most vehicles at & below tier 7 will be eradicated without even a proper fighting chance. Against same tier or sometimes higher tier heavies, these 3-round clips could still remove over half of their HP bar before the opponent reloads. In addition, its autoreloader has been balanced in such a unique way that it refills faster with lower in-clip ammo count, in comparison to the Italian mediums that can only fully utilize their DPM when single-firing. 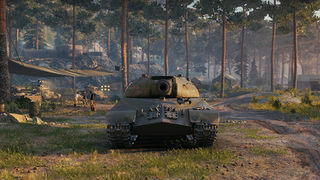 This trait assures that the IS-3A has an incredible DPM efficiency, perhaps one of the best among all heavies: in brawling, it could engage as well as an ordinary IS-3, with roughly the same ~11s base reload time; but when idle, the IS-3A stacks up its clip for later bursts, while on an IS-3 all that time goes to waste. Unlike the other Tier 8 Russian heavies, the IS-3A gets HEAT ammunition for its premium ammunition, rather than APCR. This requires more careful target selection to avoid hitting obstacles or spaced armor, which, when combined with the gun's poor accuracy, can be a problem. It also means that there is a huge difference in shell velocity between standard and premium rounds (1400 vs 820 m/s), which makes hitting moving targets more difficult. However, due to the tank's brawling character and ability to reload the last round in clip (thus switching between ammo types) quickly, it is suggested that one should consider bringing some into battle. Yet mind its small ammunition capacity; don't spread out too thin on different shell types, since the HE shell can also be useful against lightly armed scout/sniper vehicles or for scratching tough-skinned behemoths. The IS-3A has good armor, with a hull identical to that of the IS-3. The turret, however, is thinner and flatter on the sides and rear, meaning that shots which would have ricocheted off the side of an IS-3's turret are somewhat more likely to penetrate the IS-3A's. Incidentally, both the gunner and commander are considered "loaders" and it may be worthwhile to train safe-stowage on one of them if a player intends to use the IS-3A regularly and competitively. Overall, the IS-3A is effectively a D-25T armed IS-3 that trades off mobility, side protection and handling for an autoreloader with improved ammunition. 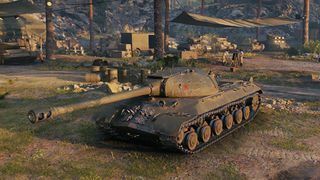 All of this combined with the likelihood of seeing tier 10 vehicles regularly makes the IS-3A a tier 8 heavy better suited for more skilled players who can more capably compensate for its many crippling weaknesses. As a premium tank, the IS-3A has no upgrades. Research not required. This page was last modified on 30 December 2018, at 16:20.